A Mexican agate, showing only a single eye, has received the name of cyclops agate. Included matter of a green, golden, red, black or other color or combinations embedded in the chalcedony and disposed in filaments and other forms suggestive of vegetable growth, gives rise to dendritic or moss agate. 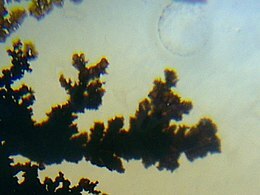 Dendritic agates include fern-like patterns formed due to the presence of manganese and iron oxides. Other types of included matter deposited during agate-building include sagenitic growths (radial mineral crystals) and chunks of entrapped detritus (such as sand, ash, or mud). Occasionally agate fills a void left by decomposed vegetatable material such as a tree limb or root and is called limb cast agate, due to its appearance. Enhydro agate contains tiny inclusions of water, sometimes with air bubbles. 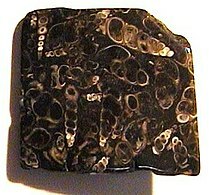 Turritella agate is formed from silicified fossil Elimia tenera (erroneously considered Turritella) shells. E. tenera are spiral freshwater gastropods with elongated, spiral shells composed of many whorls. Similarly, coral, petrified wood and other organic remains or porous rocks can also become agatized. 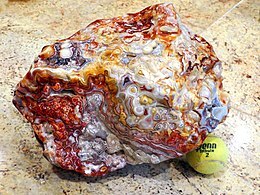 Agatized coral is often referred to as Petoskey stone or agate. Coldwater agates, such as the Lake Michigan Cloud Agate, did not form under volcanic processes, but instead formed within the limestone and dolostone bedrock of ancient oceans. Like volcanic-origin agates, Coldwater Agates formed from silica gels that lined pockets and seams within the bedrock. These agates are typically less colorful, with banded lines of grey and white chalcedony. Greek agate is a name given to pale white to tan colored agate found in Sicily, once a Greek colony, back to[clarification needed] 400 BC. The Greeks used it for making jewelry and beads. Lace agate is a variety that exhibits a lace-like pattern with forms such as eyes, swirls, bands or zigzags (if these[clarification needed] predominate, it is called lattice agate). Crazy lace agate, found in Mexico, is often brightly colored with a complex pattern. Blue lace agate is found in Africa and is especially hard. Other agates include: Blue lace, Purple lace, Pink lace, Moss, Fire, Onyx, Botswana pink, Apricot, Light pink, Condor, Enhydro, Iris, Fairburn, Thunder egg, Plume, Coyamito, Sagenite, Fortification. Respiratory diseases such as silicosis and higher incidence of tuberculosis among workers involved in the agate industry have been reported from India and China. ^ Donald W. Hyndman, David D. Alt (2002). Roadside Geology of Oregon (18th ed.). Missoula, Montana: Mountain Press Publishing Company. p. 286. ISBN 978-0-87842-063-6. ^ "Agate Creek Agate". Archived from the original on 16 July 2007. Retrieved 2007-07-01. ^ "Achates". Retrieved 19 September 2014. ^ "Geodes: The rocks with a crystal surprise inside!". geology.com. Retrieved 2018-05-15. ^ Brays, Karen. "Customer Agate Finds". Gitche Gumee Museum. Retrieved 18 April 2018. ^ Polk, Patti (2016). Collecting Rocks, Gems and Minerals: Identification, Values and Lapidary Uses. F+W Media, Inc. p. 80. ISBN 9781440246159. ^ "Socio-Cultural Impacts of Water Resource Development in the Santiam River Basin" (PDF). Oregon State University: Water Resources Research Institute. October 1970. p. 9. Retrieved February 19, 2012. ^ "Agate Windows - Community Presbyterian Church". Retrieved 19 September 2014. ^ Beltrán, Antonio (1984). El Santo Cáliz de la Catedral de Valencia (in Spanish) (2 ed.). Valencia: Nacher. ^ Chaudhury, Nayanjeet; Phatak, Ajay; Paliwal, Rajiv (January 2012). "Co-morbidities among silicotics at Shakarpur: A follow up study". Lung India. 29 (1): 6–10. doi:10.4103/0970-2113.92348. PMC 3276038. PMID 22345906. ^ Jiang, CQ; Xiao, LW; Lam, TH; Xie, NW; Zhu, CQ (July 2001). "Accelerated silicosis in workers exposed to agate dust in Guangzhou, China". American Journal of Industrial Medicine. 40 (1): 87–91. doi:10.1002/ajim.1074. PMID 11439400. ^ Tiwari, RR; Narain, R; Sharma, YK; Kumar, S (September 2010). "Comparison of respiratory morbidity between present and ex-workers of quartz crushing units: Healthy workers' effect". Indian Journal of Occupational and Environmental Medicine. 14 (3): 87–90. doi:10.4103/0019-5278.75695. PMC 3062020. PMID 21461160.